The Coming Collision: God vs. gods! Mark Twain said, "When you find yourself in agreement with the majority, it’s time to pause and reflect!" Another way of putting this quote from Mark Twain is that the drummer whose beat we find most overwhelming usually does not play to please the crowd at large. And, we find this equally true of the God that we serve. God has always appeared a bit out of agreement with the masses… and of course, that’s why they have tried to change Him to suite their ways and beliefs. Also why some of the experts become frustrated by the moral standards of the ‘Most High,’ that there is agreement among those who know what is best for all of us… that Yahweh is just going to have to step aside to give ‘a bit of space for a much improved way or modern way of doing things.’ For example, today we have many who are saying that there is more than one way to heaven and that God just has different names! There are Mega-church founders in the USA that are promoters of "Chrislam," which is defined as "a uniting of Christianity with Islam." This is sadly so wrong… to partnership on the basis that the God of the Bible and the god of Islam are one and the same is just nonsense. Any close study shows that Allah has an altogether different nature from the God of the Bible. The only similarities is that Allah means god in Arabic However that same term has been used of many from pagan idols such as Baal, Ashtoreth and even man has been referred to as being gods. Just because the Bible acknowledges such facts does not mean Gods approves of them as being bonafide gods with all the qualities that are associated with GOD. The Bible is not exclusively about the Jews... Nor, is it a book how we can discover the right ‘fire-escape’ for another world… it’s a book about Yahweh, God… It reflects the principles of an infinitive and inexpressible Creator – principles or covenants – either for or against us. He chose to represent Him and reflect Him as well as for or against all the rest of us who would presume to identify with Him. The Scriptures are a record of the ONE and ONLY God of the universe who is bound to have the last word with His creation. The God of the Bible however has made His Names known, His nature and His will through the Scriptures and to His chosen people, Israel. Another loner (just like Mark Twain) who we can relate to in the Bible was the prophet Jeremiah who neither mixed with the majority nor made too many friends because of it… He did have at least two "buddies" (a good South African term for "friends"). 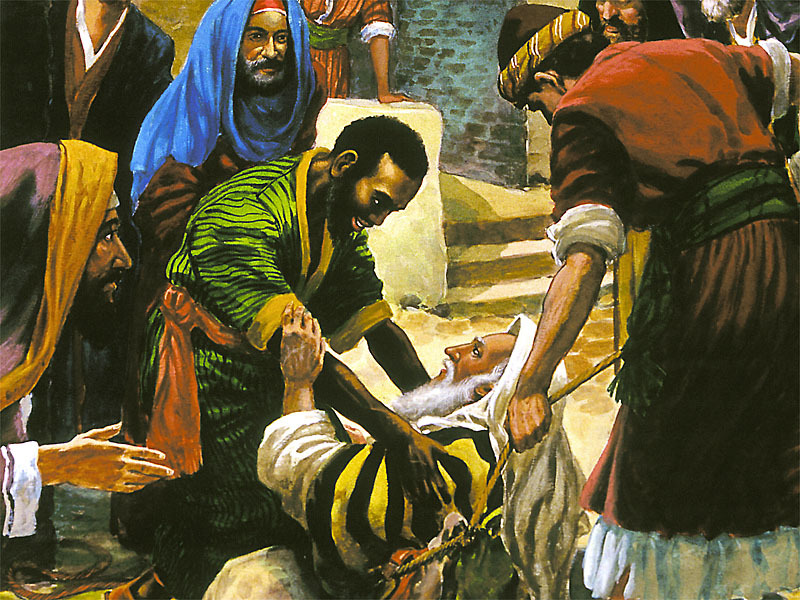 One was Ebed-Melech, an Ethiopian who rescued him out of a nasty, dirty pit where the King’s servants had left him to die (Jeremiah 38:7). Actually he wound up there because he told the TRUTH! Jeremiah had another helper, Baruch (means blessed in Hebrew) and he was certainly a blessing to Jeremiah. Baruch wrote down the sacred Word’s of God given to Jeremiah after the king had burned the scroll. And, if he wouldn’t have done that, part of our Bible might still be missing today. He was Jeremiah’s good friend as he stood alone… almost alone! (Jeremiah 36) So we see here an encouraging precedent by not flocking after the politically correct. On the 21st October, 2013, just as Noah of Genesis 6 / 7 in ancient times, world-renowned evangelist Billy Graham (94 years) is sounding the alarm! "There’s a great deal to say in the Bible about the signs we’re to watch for, and when these signs all converge at one place we can be sure that we’re close to the ‘end of the age,’ and those signs, in my judgment, are converging now for the first time since Jesus made those predictions." Billy Graham said, he now has; "a burden for sounding the alarm for humanity to repent and turn from their sin … just as Noah did in ancient days. God keeps his promises, and this is why we can be sure that the return of Christ is near, Scripture tells us that there will be ‘signs’ pointing toward the return of the Lord. I believe all these signs are evident today." Earlier in the same month of October, Israeli Prime Minister Benjamin Netanyahu told the United Nations General Assembly "biblical prophecies are being realized!" This is a significant prophetic statement. Change is on the horizon for 2014 and 2015… involving "blood moons on Jewish holy days" and prophetically significant events on the ‘Shemitah’ (the ancient biblical year of the Sabbath)… are igniting even more interest in humanity’s ultimate fate! What is God saying to us? Are we listening? Every time the US, UN, EU and other Western Nations try and divide the Land of God – Israel… or bring hardship to His people… judgement follows! Signs in the heavens… If we go to the book of Genesis we see a profound statement made by Moses in his account of the creation of the heavens by God Almighty. Why did God create the stars in the heavens in the first place? We read one significant answer in Genesis, the first chapter. Moses wrote: "And God said, ‘Let there be lights in the expanse of the sky to separate the day from the night, and let them serve as signs to mark seasons and days and years." (Genesis 1:14) From a biblical perspective the use of the Sun and Moon as signs is evident. 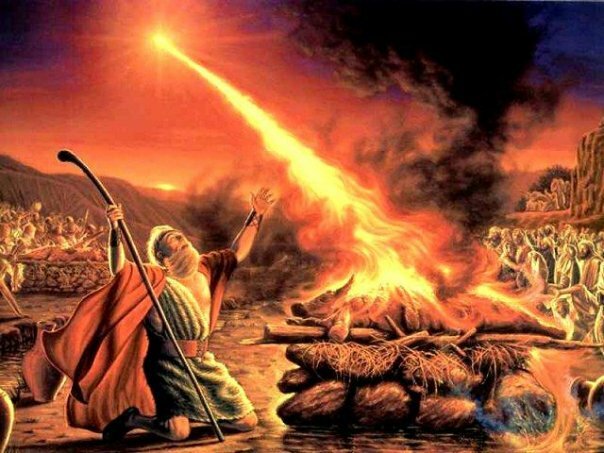 For instance in the book of Joshua chapter 10, the sun and the moon stood still for Joshua and his army over Gibeon, so they could have enough day time to complete the war. In Genesis we see that a young Joseph had a dream that involved the sun, moon and stars which would become a symbolic prophecy of his rise to greatness. The Total Eclipse of August 11th, 1999… millions of people across Europe, Middle East and Africa witnessed a total solar eclipse. We were in Turkey at the time of this total eclipse and just as we and millions witnessed an eerie feeling as darkness descended, a feeling of being off balance as the air cooled down and the birds stopped singing. Because of the high density populated in the areas of the path, there is little doubt that this was the most-viewed total solar eclipse in human history. A solar eclipse; occurs when the Moon passes between Earth and the Sun, thereby totally or partially obscuring the image of the Sun for a viewer on Earth. A total solar eclipse; occurs when the Moon’s apparent diameter is larger than the Sun, blocking all direct sunlight, turning day into darkness. Totality occurs in a narrow path across the surface of the Earth, while a partial solar eclipse will be visible over a region thousands of kilometres wide. Then the Earthquakes that followed…. 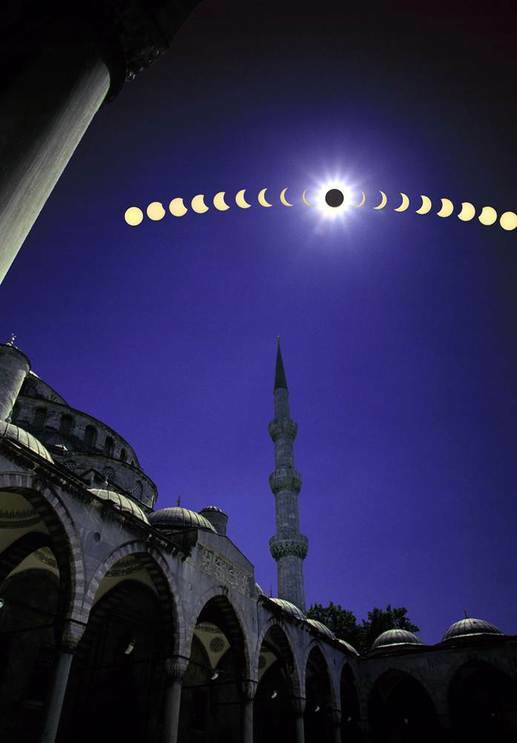 That day in Turkey when the eclipse came upon us, there was a deep sense that something was about to change… and that the world would never be the same again! Our feelings became a reality when on 17 August, 1999; people in north-western Turkey experienced the sudden, ground shaking movement of a major earthquake, which resulted in thousands of deaths and widespread damage. The earthquake, measuring 7.8 on the Richter scale, also led to the collapse of thousands of buildings and caused extensive damage to much of the industrial infrastructure. Three short months later, in November the country was rocked by another major earthquake, measuring 7.2 on the Richter scale, causing hundreds of deaths and injuring thousands more. We were personally involved on hand in helping victims in the aftermath of both earthquakes for some years, and established a "Hope Centre" in Duzce where the second earthquake of 11th November (also the epicentre) took place. The earthquakes were less than a minute… but the impact of devastation was so severe that it will be remembered for many years. When major astronomical and heavenly events take place it has been natural to turn to the Bible for validation since Yeshua (Jesus) Himself said, referring to the days before His second coming: "And there will be fearful sights and great signs from heaven"….."And there will be signs in the sun, in the moon, and in the stars . . ." Luke 21: 11, 25. However, there are specific references that focus on the moon looking "blood red" in the lead up to the great and terrible Day of the Lord and it is for this reason that the prophecy of the Blood Moon Tetrads is causing a ripple across the Bible community. "The sun shall be turned into darkness, and the moon into blood, before the coming of the great and awesome day of the LORD," Joel 2:31. Blood Moons are when the moon appears red due to lunar eclipses…They occur when the earth is positioned between the sun and the moon (see top part of image below). The Earth’s shadow blocks the sun’s light, which would normally reflect off the moon. The delicate layer of dusty air surrounding our planet reddens and redirects the light of the sun, filling the dark behind the Earth with a sunset-red glow. This is in contrast to a solar eclipse where the moon is positioned between the earth and the sun causing darkness. Blood Moon lunar eclipses have happened continuously throughout history, BUT a Blood Moon Tetrad is when 4 consecutive total lunar eclipses occur on a Jewish Holy Feast day. According to NASA, there have only been 7 Blood Moon Tetrads between Yeshua (Jesus) first coming and 2013, and every time they happened it has been proven that there was some significant event which impacted upon the Jewish people within a year of the first or last eclipse of the tetrad. The only time during this century (2000 AD – 3000 AD) that a Blood Moon Tetrad will take place is the year 2014-2015. Something significant is going to happen in 2014 and 2015 which will involve Israel and the world. Why…? The rabbis teach that blood moons with "lunar eclipses" are a sign used by God for the judgment of the Nation of Israel. And, they also teach that solar eclipses are a sign for the judgments of the nations of the world. Historically there is evidence that such occurrences always seem to take place at a time where there are world impacting events. The next combination of lunar (4) and solar eclipses (2) to fall on the appointed feast days will occur in a time period that covers 2014 and 2015. NASA found that we have had "blood-red moons" on the first day of Passover and the first day of Sukkoth on back-to-back years seven times since 1 A.D. Three of these occurrences were connected to 1492 (the year that Ferdinand and Isabella expelled all the Jews from Spain), 1948 (statehood for Israel and the War of Independence), and 1967 (the Six-Day War) — some of the most significant days in Jewish history. God’s eternal plan, from chaos to eternity… is incredibly revealed through the nature and timing of the Seven annual Feasts of the LORD… It was on Mount Sinai that God gave Moses the dates and observances of the Seven Feasts. When do they happen? God’s calendar is based on the phases of the moon. Each month in a lunar calendar begins with a new moon. Pesach (Passover) falls on the first full moon of spring. 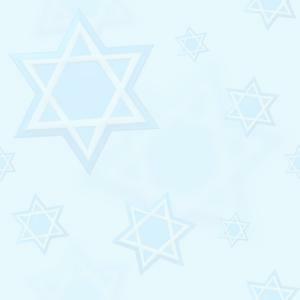 The first three feasts, Pesach, Unleavened Bread and First Fruits fall in March and April. The fourth one, Shavuot (Pentecost), marked the summer harvest and occurs in late May or early June. The last three feasts, Trumpets, Yom Kippur and Sukkot (Tabernacles) happen in September and October. Understanding the Feasts of the Lord is singularly one of the most critical components of bible prophecy. Recent series of Earthquakes in Israel….! Five small earthquakes were felt in Northern Israel in the area of Tiberius in less than a week with the first one on Thursday the 17th October, 2013… we personally felt two within a few hours on Sunday 20th October. At around 12:00pm in the afternoon the same day, the seismology department at the Geophysical Institute reported a 3.6 earthquake. The epicentre of the earthquake was five kilometres east of Kibbutz Ginosar (Sea of Galilee), at a depth of two kilometres. The sixth one was felt in Eilat (in the south at the Red Sea). On the 23rd September another 4.8 on Richter scale was felt in Jerusalem. The earthquake with the epicentre at the Dead Sea, felt this day didn’t cause movement in the Great Rift Valley… but movement in the valley near the sea. The fact is that the earthquake was felt in a radius of hundreds of kilometres, even in Egypt. Earlier In the month of June, 2013 an additional earthquake was felt in Israel… in the area of Eilat at the powerful 4.8 ranking. The earthquake was focused 200 kilometres south of the city in the area of the Suez Cannel. At the end of the day, the geological boundary of the ocean moved, grew bigger and widened, resulting in frequent earthquakes in the area. Due to the series of minor earthquakes, Prime Minister Benjamin Netanyahu convened a meeting on the Home Front’s preparations for dealing with earthquakes. Eli Yishay (Home Front) said; "We mustn’t ignore the phenomena that have befallen us recently!" Every 80 years or so, Israel has a major, catastrophic earthquake… So Israelis know they are "due" for a "big one." This is what the LORD Almighty says, "In a little while I will once more shake the heavens and the earth, the sea and the dry land." (Haggai 2: 6) Those who pay attention to Bible prophecy also know that both the Old and New Testament Scriptures describe major earthquakes occurring in Israel in the last days. The most predictable truth on Earth is Change… Change is inevitable. Everything in Creation will change, nothing remains the same. There are massive changes that could take place in 2014 and 2015… changes will occur in the nations of the world. Change is the greatest Challenge of our time! One thing is certain, the Scriptures make a distinction between the "temporal" and the "eternal." Paul says that the things that are seen are "temporal" but the things not seen are "eternal" (2 Corinthians 4:18). "Time" clearly does not relate to God and man in the same way. In describing God, the psalmist declares: ". . . from everlasting to everlasting, you are God…" Psalm 90:2. Eternity is endless… but time is measured by a "beginning" and an "end." The Bible commences with these words: "In the beginning God created the heavens and the earth" Genesis 1:1. The book of Daniel in the Bible emphasizes especially the sovereignty of God. God is called "the living God," "the most High God," "the God of Heaven," "the King of Heaven." This sovereign God is in control, even of mighty human empires: "He changes times and seasons, deposes kings and sets up kings"
Daniel also emphasizes the certainty of God’s Coming Kingdom: "In the days of those kings the God of heaven will set up a kingdom that shall never be destroyed, nor shall this kingdom be left to another people. It shall crush all these kingdoms and bring them to an end, and it shall stand forever" Daniel was a man who had amazing character qualities. And God used Daniel as the vehicle through which he reveals the unfolding of the redemptive plan of the history of the world. Now that's a monumental assignment. In chapter 1 we can see the circumstances that set Daniel in the right place. We have seen something of the quality and the character of the man that equips him to be God's very special man in this particular assignment. Daniel had an amazing commitment to righteous character and he has set an un-compromising standard for his own life. 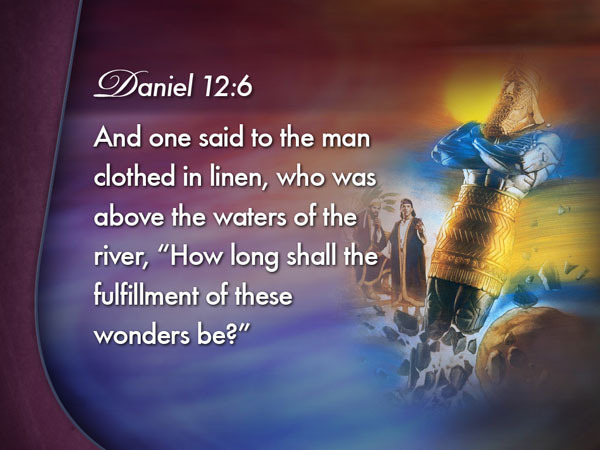 There was a supernatural ability that allowed Daniel to have knowledge, skill and wisdom that a leader need, to get to the top. The God of Daniel is the God of sovereign power. 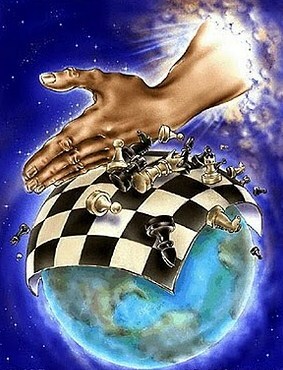 He is the God, who rules nations; He has the power to remove a king, and replace him with another one. He has the power to crush the pride of earthly rulers. He is the God that reveals secrets. All the secrets of the universe are known to God. All the past, present and future are known to God. He can tell the destinies of nations. The Bible says; "…men of Issachar, who understood the times and knew what Israel, should do... (1 Chronicles 12:32) This was a crucial time… this tribe was distinguished in Israel because they understood the times. It is a tragedy to live in ignorance of the time that we are living in… An understanding of times will help us to know how to live and fit into Gods agenda for the now. God is a planner, and no planning is done without a time frame. God times everything… Therefore, it’s important that we understand the times that we are in per time. This calls for diligence in searching out the prophecies and timings of God, especially for our lives. It is a time for special understanding. It is a time for real discernment. It is also time for us to look at what God is saying to the nations about Israel! What did the sons of Issachar understand…? They understood the times when things normally took place. They also knew when it would be a time for specific event to take place. They were able to interpret God’s Written Word by recognizing the significance of past events and applying the lessons to the present and the future. It was a crucial time because it was destined that David should be king over all Israel… The men of Issachar would understand what God was about to do, and would be a wonderful help in establishing the new kingdom. David needed such men during this crucial time in Israel’s history. The men of Issachar would see to it that David would not fail to accomplish the task of integrating the entire kingdom under his reign. Helen Keller, probably the most recognized blind person who has ever lived, once said, "What would be worse than being born blind?" She said "The only thing worse than being blind is having sight but no vision." No wonder the wise king of Israel, Solomon, stated in his book of Proverbs, "Where there is no vision, the people perish" (Proverbs 29:18). This means that where there is no revelations of God and the future, people throw off self-control, personal discipline, and restraint. "Vision is everything. "Vision is the source of personal, corporate and National discipline." King Solomon’s statement therefore captures the significant role vision has… in our individual, corporate, and national lives. Nothing noble or noteworthy on earth was ever done without vision. No invention, development, or great feat was ever accomplished without the inspiring power of this mysterious source called vision. Vision makes the unseen visible and the unknown possible. For thousands of years, people have followed and worshipped many gods of many religions. The gods of polytheistic religions usually each have an "area of expertise" such as weather or healing. There are many inconsistencies found in Greek mythology… but none are found in the Bible, the Word of God. The God of the Bible is never cowardly or hypocritical. Neither does He delight in human bloodshed or human difficulties because of His undying love and empathetic sympathy towards humankind. In fact, the God of the Bible cares for and protects His people much more than the Greek gods were ever believed to. Psalm 28:8; "The Lord is the strength of his people, a fortress of salvation for his anointed ones." God himself proclaimed His faithfulness to His people saying, "Fear not, for I am with you; be not dismayed for I am your God; I will strengthen you; I will help you; I will uphold you with my righteous hand." (Isaiah 41:10). God did not leave His people wondering like those who worshipped the Greek gods, whether or not they would protect them. Further inconsistencies include the sinful behaviour of the gods. The Greek gods were not "role models" for the Greek people. In fact, the Greek gods were created in the image of man. This image included all human attributes, especially the sinfulness of man. There are no inconsistencies to be found in the Bible, nor with the God of the Bible, unlike the myths of the Greek gods. This makes the God of Jews and Christians the only God that truly exists as well as the most credible deity known to man. People cannot have it both ways. Who is God...? This is an ancient question and it is a modern question…As such the question is still very much with us today. The gods of our times are many and varied. While many people in the world today would identify with one of the major world religions such as Christianity, Islam, Hinduism, or Judaism, under each of these major religions the question of "Who is God?" can often be interpreted by what a person loves. Some Christians see God in the blessing of their wealth or even in their political agenda. Fundamental Muslims see their god Allah in the "jihad", the holy war against the West. Beyond this, many people see God when they look in the mirror and worship the God within... or, when they look upon the faces and lifestyles of the Hollywood entertainers... or the adoration of political leaders such as the current US President. We must keep in mind the warning in 1 Corinthians 4:4 where the apostle Paul writes, "The god of this age has blinded the minds of unbelievers, so that they cannot see the light of the gospel of the glory of Christ, who is the image of God." The showdown on Mount Carmel in 1 Kings 18 between the prophet Elijah and the prophets of Baal is a dramatic depiction of the First Commandment and speaks to the past and to us in the present. "Who is God?" Is "Yahweh", the covenant Lord, the true God of heaven and earth? 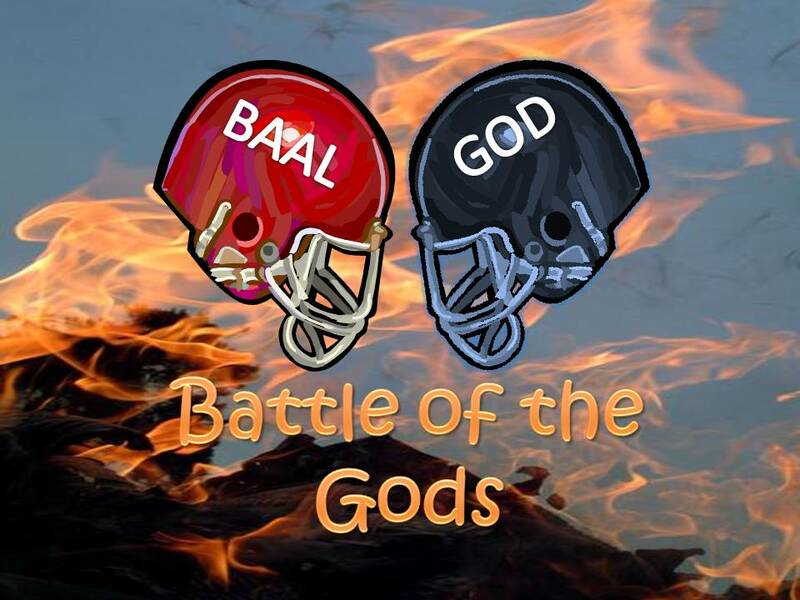 Or is "Baal", the fertility god of the pagan nations around Israel, the Lord of heaven and earth? Elijah frames the essential question of the day in verse 21 where he says, "How long will you waver between two opinions? If the Lord is God, follow him; but if Baal is God, follow him." In some translations the word "waver" is translated as "limp". "How long will you go on ‘limping’ between two opinions?" In His Law the Lord says, "I am the Lord your God ... You shall have no other gods before me." We approach God on His terms, not our own. Before the sacrifice of Christ on the cross, the sacrifices of God’s people in the Old Testament were done in such a way that they were in accordance to his Word. Elijah rebuilds the altar of the covenant Lord with 12 stones, representing the whole nation of Israel (12 Tribes), not the divided nation which existed in his day. He honours the will of God in the building of an altar. This altar is a sign of the cross on which the ultimate sacrifice for our sins would be made. This is the place where we are invited to come, because this is the place where God answers the question for us! "Who is God?" God is the One who answers us. He is the one who answered our sin with his Word of grace. He is the God made known in Yeshua (Jesus Christ). Psalm 29 says, "Ascribe to the Lord, O mighty ones, ascribe to the Lord glory due his name; worship the Lord in the splendour of his holiness. The voice of the Lord is powerful; the voice of the Lord is majestic." This Lord is made known in the fire sent down at Mount Carmel and He is made known in the man on the cross. Before Him no one will remain silent. Every knee will bow before Him and every tongue will confess Him as Lord and King. Amen. George Washington, the first president of USA, said; ‘‘it is impossible to rightly govern the world without God and the Bible. We certainly cannot be smarter and wiser than our Creator."